Bringing both sides of the gun debate together by Creating a Viral Sensation with over 7MM views and $212MM in earned media with $0 budget, 100% Earned Media. We serve as an outsourced CMO on Virgin's Online Casino and Tropicana's Online Casino brands for Gamesys UK. Brand Strategy, Agency selection, Media Strategy, and more. The marketing of the ANA + White Ops Study helped fuel the buzz around Bots, which was really a 2 year old discussion we had to re-ignite. 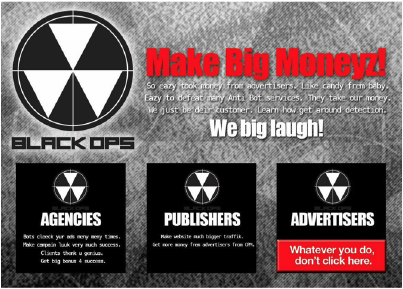 We started at the ANA National Leadership conference by creating and marketing the evil twin of White Ops, called Black Ops. Black Ops had a Black Hacker Van, parked right outside the conference patio which looked like a hacker lair and educated marketers on how bots steal their money. They also actively recruited the marketers, with their own website, leaving bags of fake money in all their rooms to lure them to the van…and the money bought people Black Russians at the event. The marketing itself got written up in the Wall Street Journal. Hyper targeting 4,000 hard to reach decision-makers by leveraging the latest Ad Tech tools in practice to create dramatic optimization results. The Think Further Platform. For AVG Security we developed a series of videos that educate teens/tweens who get their first smart phone what not to do in a language they could relate to. The videos were presented at the Mobile World Congress in 2015 to engage Carriers to join the program.